All is right in the world when there are homemade cookies and milk. If those cookies include chocolate, have barely undercooked centers, and the edges are slightly crispy, you are reaching snack time nirvana. 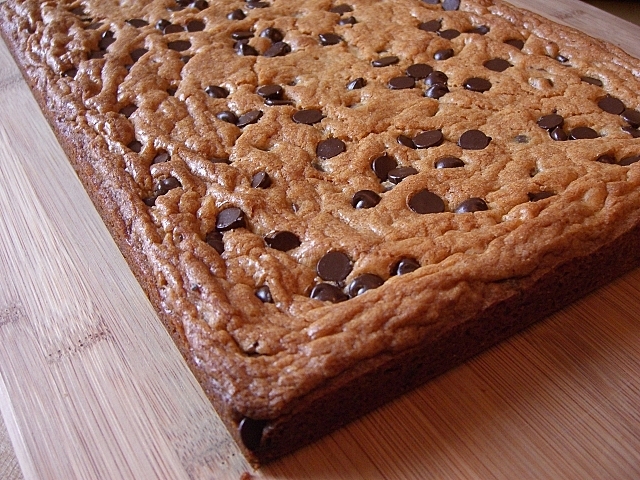 Dark Chocolate Butterscotch Bars meet all of my perfect cookie requirements. The bars cut from the middle of the pan stay chewy while the ones around the edge of the pan have a buttery, crunchy crust. The only problem with these treats is that they disappear too quickly. Preheat oven to 350 degrees. Line a 9 x 13 inch baking pan with parchment paper. Set aside. Beat butter, brown sugar, and vanilla extract in a large bowl until creamy. Combine flour, baking powder, and salt. Beat in eggs. Gradually beat flour mixture into butter mixture. Stir in 1 cup of the chocolate chips. Spread into prepared pan and sprinkle remaining chocolate chips on top. Bake for 30 - 35 minutes or until a toothpick inserted in the center comes out clean. Cool in pan. Invert pan on a cutting board, remove parchment and cut into bars. Those look absolutely fantastic. I can tell all would be right in my world, too, if I had a pan of those waiting for me! Not only do these look absolutely delicious but both pics are really gorgeous as well! YUMM!!! Love that combination! Marking this one to try soon as I get some butterscotch chips! Typing too fast... I meant dark chocolate chips! LOL! These look great. Two favorites in this house...chocolate and butterscotch! Mmmmm yum! My husband would love these! This picture of the whole bar is mine! 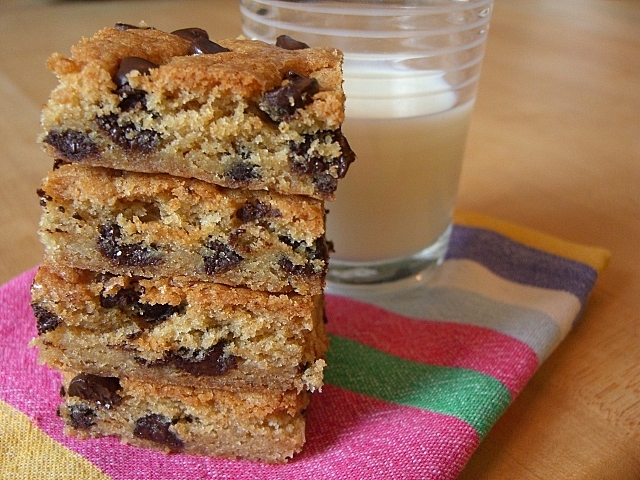 What a grand treat this bar is, perfect with tea or coffee or even a big gulp of cold milk! I'm drooling over my screen right now! These look amazing, thanks for sharing! Ohhh my. These look sooo scrumptious! Oooh these DO sound like the perfect bar - and I love butterscotch! Another yummy sounding recipe! Thanks for sharing! I cant wait to try it! Oh yum!! I love bar cookies. These look so so good! Me again! Just posted these - they were delicious!